Thank you for your interest in the Academic Peer Mentor position within the Department of Residence Life. 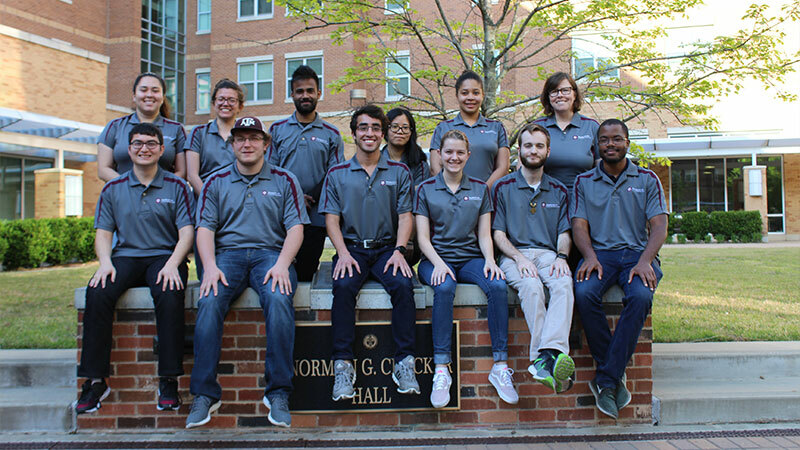 Academic Peer Mentors (APMs) live in the residence halls and apartments, and help residents succeed academically. Please feel free to use the toggles below to learn more about the position before applying. You will find an outline of the position, an overview of the programs APMs offer, some frequently asked questions, and our contact information. Academic Peer Mentors (APMs) live in the residence halls and apartments, and help other students succeed academically. APMs are expected to work 15-20 hour per week, possess full-time student status, and maintain a 3.0 Grade Point Ratio. Review more about the position and application process below. The Academic Peer Mentor program is a competitive application and a three-part selection process. The three parts include (1) an application review, (2) interview, and (3) presentation. Applicants who make the application review will be invited to a 30-minute panel interview. The panel will be comprised of current APMs and professional staff from the Department of Residence Life. Approximately 30 finalists will be selected based on the panel interview. These finalists will be invited to present a 15- 20 minute presentation followed by a 10-minute question and answer session to a small audience of Residence Life staff. The presentation prompt will be included in the email to finalists. Selections and offers will be made by the week following the finalist presentations. Thank you for your interest in and applying for an Academic Peer Mentor (APM) or Senior Academic Peer Mentor (SAPM) position within the Department of Residence Life at Texas A&M University. Please review the information on this website as well as the Position Description(s) before you complete an application. The (Senior) Academic Peer Mentors are compensated in a similar manner to Resident Advisors. APMs compensation packages includes: (1) 10% discounted room rate on campus, and (2) an hourly starting compensation of $8.35 an hour. Senior Academic Peer Mentors will also have single rooms, while APMs may share a room with a roommate of their choice or potluck. The Academic Peer Mentor program is certified as an International Mentor Training Program by the College Reading and Learning Association. This enables Academic Peer Mentors to pursue three levels of professional certification as a peer mentor to aid in the professional development. Due to the international recognition of the program, this certification can also be added to their resume. This certification process is built into the fall and spring training along with regular staff meetings. As Academic Peer Mentors progress in their certification requirements, this may enable promotions or increases in hourly pay rates – as applicable. The Academic Peer Mentor application includes basic demographic information including Grade Point Ratio, Major(s)/Minor(s), contact information and other basic information. In addition to the demographic information, applicants will be asked to submit the following three documents. Cover Letter: On a separate sheet of paper, submit a cover letter addressed to the “Selection Committee” to support your application and introduce yourself. It should explain your interest in the Academic Peer Mentor Position; your educational, personal and career goals; what skills/leadership experience you can bring as an APM; and any other relevant information. The cover letter must be between ¾ and 1 page in length, single-spaced, contain font sizes no smaller than 11 point, and be formatted with margins at 0.5 or larger. Be sure to use a correct business letter format. Visit the Career Center for advice at http://careercenter.tamu.edu/. Professional Résumé: On a separate sheet of paper, submit a professional résumé (maximum two (2) pages, but one (1) page preferred) with this application outlining your job experience, leadership or organizational involvement, awards/honors/special recognition, and other information you feel is relevant. Remember to list any extracurricular involvement at Texas A&M University. Do not include references. We recommend visiting the Career Center to get feedback on your résumé. The Career Center offers walk-in hours for résumé review. Writing Sample: Provide a copy of an assignment you are most proud of so far in your academic career. This must be individual work and may have been submitted previously for a course assignment. The writing sample does not have to be in MLA, APA, etc., but may not be longer than 5-pages in length or short than 1-page double spaced. Review your writing sample! The University Writing Center is an excellent resource. You can schedule an appointment online with a member of the Writing Center staff to review your essay or simply utilize their online resources. Visit the Writing Center at http://writingcenter.tamu.edu or contact the Writing Center at 979.458.1455 for more information. You are expected to comply with the Aggie Honor Code. Suspected plagiarism will be reported to the Aggie Honor Office received by the application deadline. References: Please provide the name, title and email of up to three professional reference. Professional references may be from professors, academic or organizational advisors, employers, or others who can discuss your qualifications in depth. Only one may be from a personal nature. Academic Check-Ups – Academic Check-Ups are regular meetings between a resident and an APM where a student receives academic coaching. Let an APM help you stay on track academically to meet your goals in a course or for your major. Register today! Office Hours – APMs are available online through eCampus and/or in-person in the Community Learning Centers on campus to discuss general academic issues with residents. No appointment or scheduling necessary. Academic Skills Presentations – APMs offer weekly topic-based presentations that are meant to develop or expose residents to new study skills and techniques. Sessions include: time management, writing an “A” paper, learning styles, and more! Check your TAMU email for information or select Residence Life on our Event Registration System to view upcoming sessions. Request a custom presentation for your group or organization. eCampus: Academics in Residence – All on campus students have access to the “Academics in Residence” eCampus organization at ecampus.tamu.edu. This portal contains a programming schedule, glossary of academics terms, online chat sessions with APMs, online study assessments, and more! Senior Academic Peer Mentors and Academic Peer Mentors are required to live on campus for the term of their employment. If you have applied for on campus housing and even if you have not, Residence Life will ensure your housing application and placement is updated should you be hired. Signed a lease off campus already? Unfortunately, Residence Life is not able to assist you with any penalties or fees for canceling a lease if you are offered the position. Placement of which hall/apartment you live in can be tricky. This is because some halls and spaces are restricted by gender. Most residence halls and each of our two apartments communities will have either a Senior Academic Peer Mentor or Academic Peer Mentor. As a staff member in the APM program, you will receive a 10% discount off the rate. Rates without the discounts can be found on on our rates page. Please come to the interview with your top three preferences of halls/apartment placement. To learn more about our various styles of residence hall and apartments, please visit our Housing Options page. Training is mandatory for all Academic Peer Mentors. APM training will begin two weeks before Howdy Week for the fall semester. Specific dates will be given during interviews. During these two weeks in fall and one week in spring, APM training will be the priority. If APMs participate in a student organizations that have a conflicting event during this time, Residence Life will ask that they attend training. Competing academic commitments will be approved on a case-by-case basis. You are about to take the first step toward a different type of student leadership and service role — and we’re delighted you’re considering the Academic Peer Mentor position! The formal application is now closed. If you are interested in potential openings, please contact apm@housing.tamu.edu. To apply to either the Academic Peer Mentor or Senior Academic Peer Mentor position, you will complete an online application. In the event you do not complete your application in one sitting, click on the Save and Continue Later link at the bottom of the page. It will provide you a unique URL link to complete your application at a later time. Click here to start the application process. If you have already started an application and have not submitted it, you can use the unique URL that was provided to you after clicking the Save and Continue Later link to finish your application. A copy of this link may also have been emailed to you. Do not have a link? Contact the office for your unique link connected to your application.